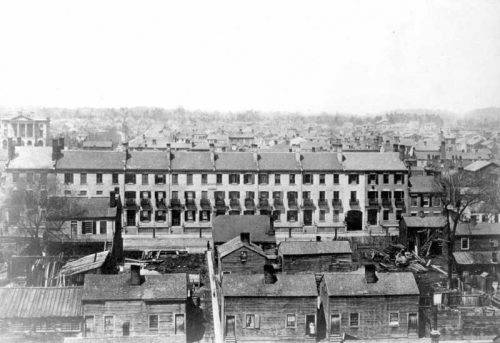 Housing in 19th century Toronto consisted of a mixture of modest and substantial dwellings, both freestanding and in rows of attached and semi-detached units. Toronto experienced two significant periods of subdivision activity, in the 1850s and the 1880s, resulting in an increasing number of urban lots. In addition, its boundaries were expanded through a series of annexations between 1883 and 1893. Both of these stimulated the construction of housing, quickly filling in the city’s limits by the end of the century. Outside of the city, the rest of York County was largely rural, with housing consisting of farm homes, along with the small clusters of houses associated with the towns and villages that grew up around mills, post offices and railway stations.